Sunday is no longer a relaxing day in the mobile world. Just a few hours ago -at the time we were writing this article- and thanks to XDA member kurtis.austin2, we learned via HTC social channels that Senstation and EVO 3D owners will be able to unlock their bootloaders! According to the source, We announce today that software updates to support bootloader unlocking will begin rolling out in August for the global HTC Sensation, followed by the HTC Sensation 4G on T-Mobile USA and the HTC EVO 3D on Sprint. We’re in the testing phase for the unlocking capability now, and we expect it to be fully operational by early September for devices that have received the software updates. So, developers out there…. get ready, set, go! 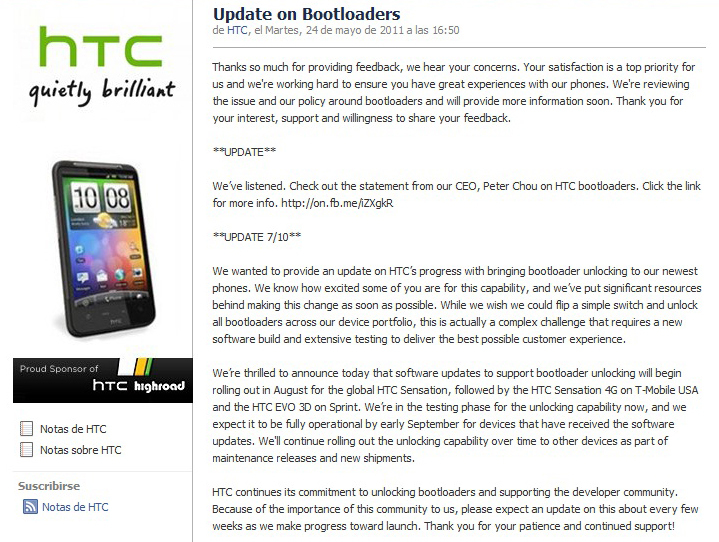 HTC confirms that the Sensation will receive an update to unlock the bootloader in August. Check out their twitter or facebook pages for more info. Continue to the discussion thread.